One of the most iconic and visible aspects of an Indian wedding is the mandap which only applies to Hindu, Jain and Sikh weddings or the altar. There are SO many styles and designs and really there’s no limit to how decorative and how much one could spend on this. This article is meant to point out the differences between mandaps on pre-existing gazebos, pergolas, or structures at the venue vs. ones that are fully made from scratch. We’re also going to talk about these differences in the context of indoor and outdoor venues. FYI: I’m using the term “gazebo” loosely to include gazebos, pergolas, and other pre-existing structure that venues have. 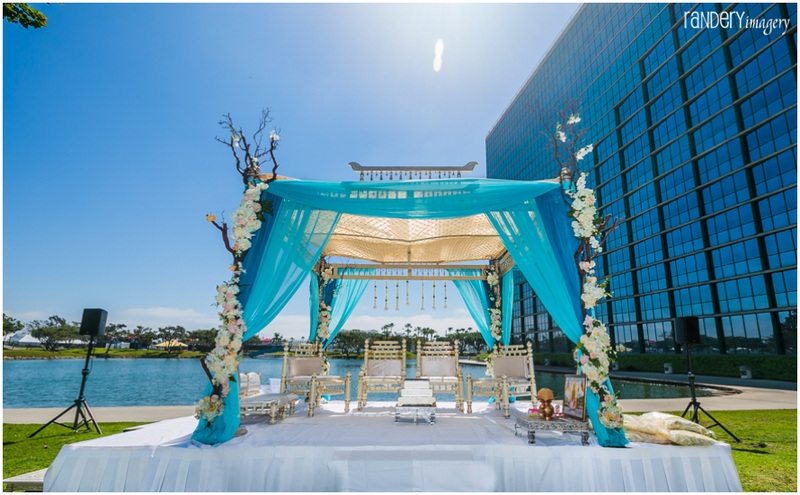 Before we get into the heart of the topic I thought you might like our Gazebo and Non-Gazebo Mandap Pinterest boards where you can get ideas. Gazebo mandaps have one key advantage over non-gazebo mandaps – sturdiness. We have heard of situations where the mandap toppled over due to poor construction or fell down due to wind. With a pre-existing structure at the venue, that’s A LOT less likely to happen. The drawback of gazebo mandaps is that they’re less unique. Every wedding at that venue has the same structure but how it’s decorated will, of course, vary. 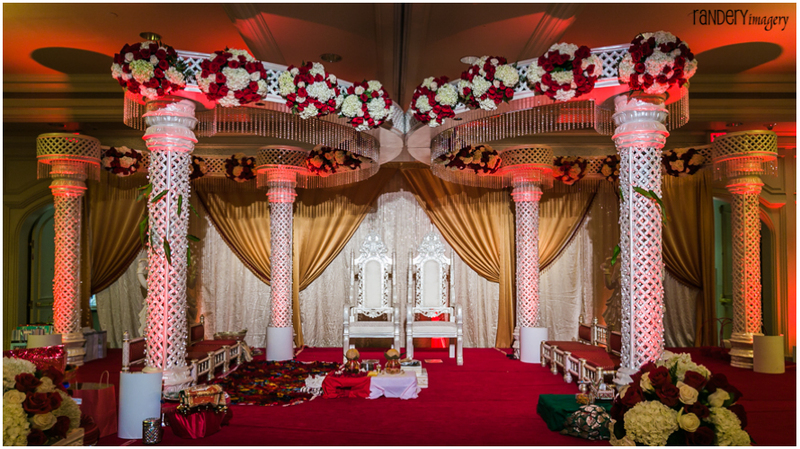 See 3 photos below – all from Indian wedding ceremonies at the same venue in the same gazebo and all shot by the same photography company. When we work with couples to help them find their wedding venue one of the things we hear a lot is, “I want a nicer venue so I don’t have to do as much with decor”. I get the sentiment but in reality the amount of decor needed, regardless of the venue, is not a whole lot different. The only difference is in the mandap’s backdrop. In the photo below, the venue has a beautiful lake behind the mandap. So you want that open mandap. But in the photo below, the view surrounding the area is tall buildings, so at that venue, you’d want a full coverage backdrop. So yes technically, there is less decor in the venue without a view but not much. You’re talking about the difference of a few hundred dollars, not thousands. No venues have a gazebo indoors so all indoor ceremonies are going to have fully built mandaps. The advantage of indoor wedding ceremonies is that you don’t have to worry about weather – hot, cold, rain, snow etc. The disadvantage is that being outdoors is nice. Since the rest of the wedding events will take place indoors it’s a nice contrast to be outside. Plus for Jain and Hindu ceremonies, you avoid any fees or additional paperwork for having the ceremony flame indoors. (Some, not all venues charge some fees for having an open flame indoors; whereas those fees don’t apply for outdoor ceremonies). Indian wedding ceremonies that are taking place indoors vary too in terms of mandaps. 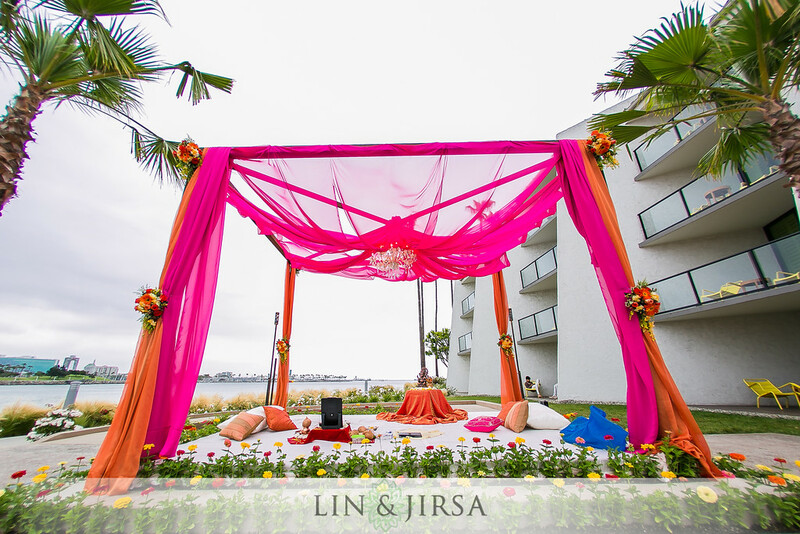 If the ballroom or space has views or floor-to-ceiling windows, such as the Huntington Ballroom at the Hyatt Regency Huntington Beach which also has views of the Pacific Ocean then you wouldn’t want a backdropped mandap. But at other venues that don’t have views or other features you would want the backdrop. The backdrop adds extra cost but in general those venues cost less than the venues with views and ballrooms featuring floor-to-ceiling windows. So whether it’s decor costs or venue fees – you pay no matter what. So how does all of this info impact your venue selection and decor decisions? For those that are worried about weather, either do an indoor ceremony or make sure you work with a company that really has their knowledge and experience on lockdown. A while ago we shared this article with a story of that time a couple went with a cheaper, less experienced vendor and the ceremony had to be moved indoors, unexpectedly at the last minute, because the vendor couldn’t get their structure to stand upright. It kept crumbling. 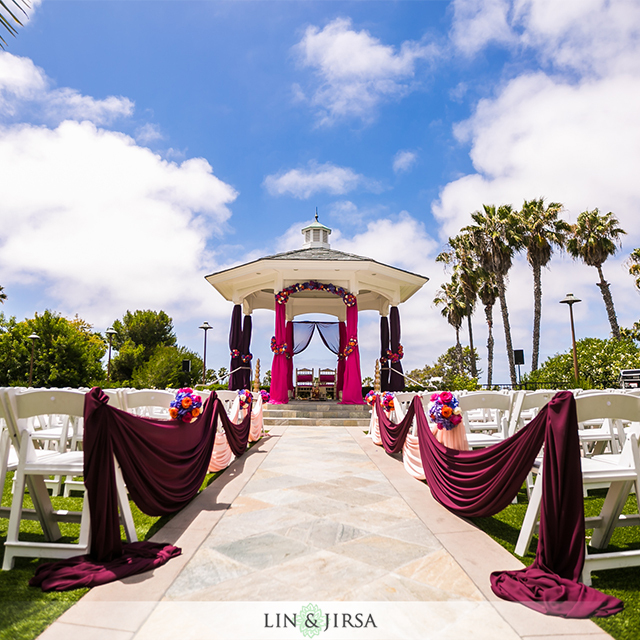 Or prioritize venues that have a gazebo/pergola/structure that can be used for the mandap. How do you know which venues do and don’t? We have that info on ShaadiShop! Save money? 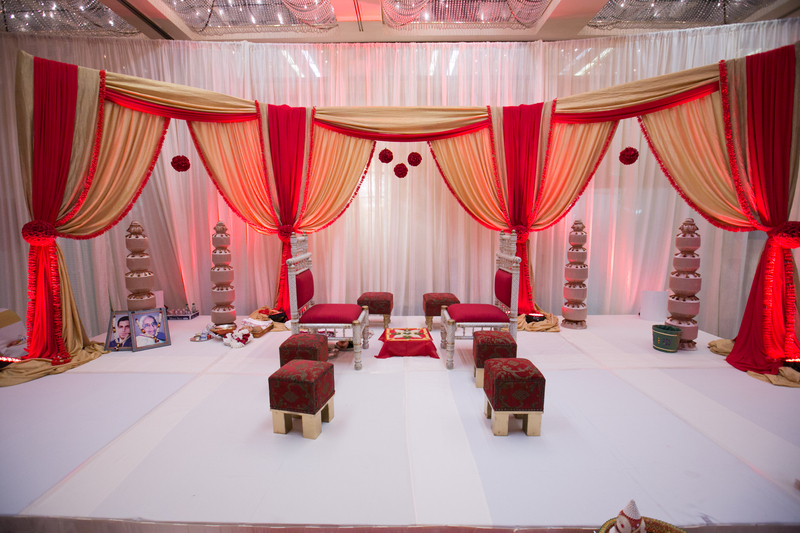 : You will save a little money if you don’t need a backdrop for your mandap which will depend on the venue you choose. But again – a few hundred but not thousands. 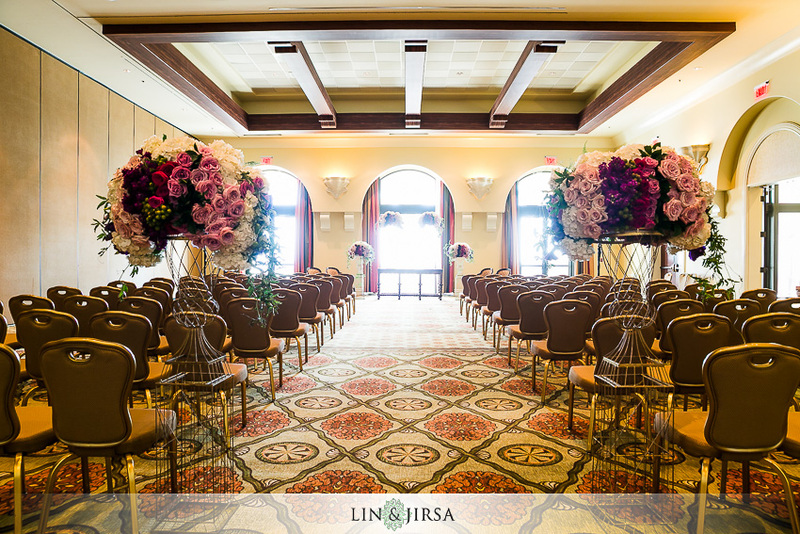 For any indoor ceremonies, unless the ballroom/space has a view, we recommend a backdrop. The fact is though the nicer venues cost more as do the ballrooms with floor-to-ceiling windows and views so whatever money you’re saving in decor, you’re definitely not saving by going with a nicer venue. 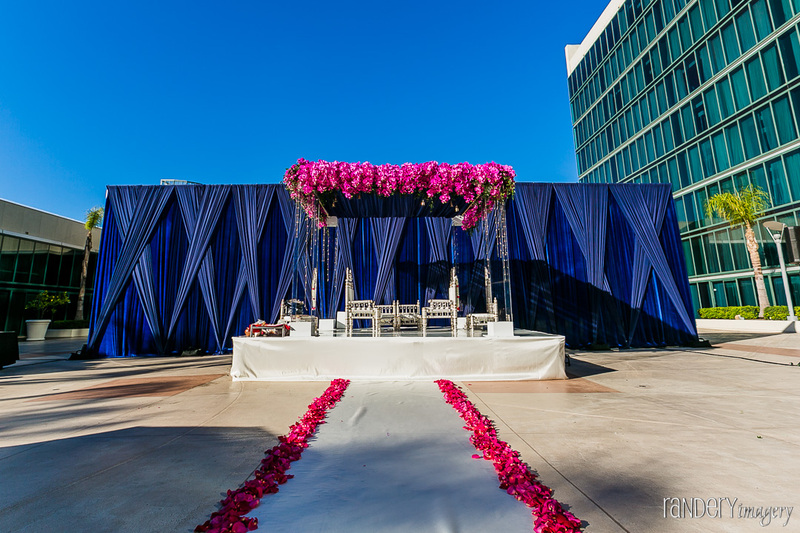 This article was all about what to know about a gazebo vs. non-gazebo mandap and provides a framework for you on how that could influence your venue and decor decisions. There are a lot of misperceptions out there about decor and costs and with every article we publish our intent is to bring consumers knowledge and information to help them make sound decisions that will lead them to the wedding of their dreams within their budget. Next Next post: Having a 250-person dry, Indian Wedding and Having a Hard Time Meeting the Venue’s F&B Minimum? Things You Can Do.